First he had the volcanic monster blem and now he is suffering from a hideous case of peeling forehead skin. Hopefully my home remedy of Eucerin is effective as we have plans to be social tonight and I'm scared of what the public might think of his scales. If it doesn't work I might have to construct an infant headdress or maybe a wide brimmed bonnet for my little reptile. Aren't you glad my busy schedule allows a sliver of time to document and publish the skin ailment chronicles: children's edish? ha ha hahahaha----Ok I love that second picture for just so many reasons. First off, we have J Bird being---well, little J. Look at her face! And Sebastian, oMG! Ok, actually he kind of looks like Uncle Dale to me in that picture. And the cherry on top of errything is the 3 advent candles, one of which is broken--I want to be there! Poor little guy. He is so cute though. I love the second picture. Do you Julia is trying to steal some of his hair for her temples? Who knows. I love the broken taper in the background. Oh, that first picture is so sad and so cute at the same time! Hope your remedy works! 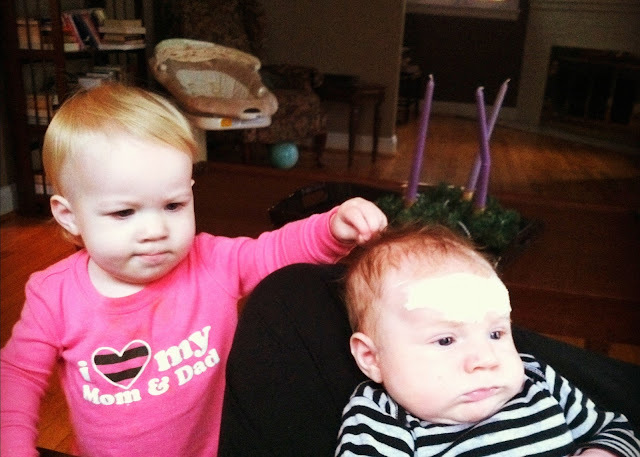 Haha, Ohhhh, I think all babies go through those phases with the acne and the drying. At least both of mine did. Here's hoping it clears up for him! If not though, I'm sure no one will even notice or care. And if they do, they will probably just come up with fun names for him, like Snakebastian. Haha, j/k. Have fun with your plans, and YAY for getting out of the house! Goooo Grace! 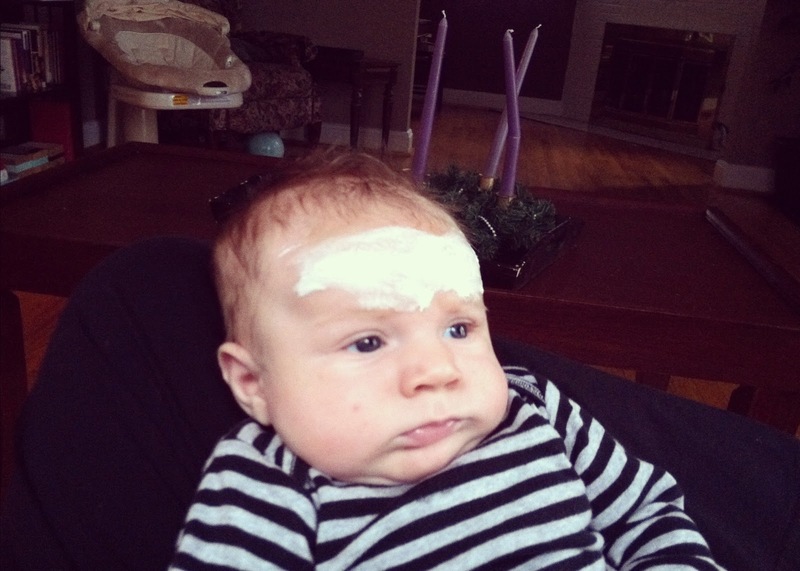 Do you have any idea how many boring homilies cradle cap has gotten me through? Personally, I'm a fan of peeling skin- it's a great ice breaker. stripes abound again! love it. did little j get ahold of the advent wreath?